Movie Review: The contemporary Austrian filmmaker and screenwriter, Jessica Hausner, gives signs of a progressively remarkable career that became more noticeable five years ago when she addressed the mysteries of faith in the impeccable “Lourdes”. 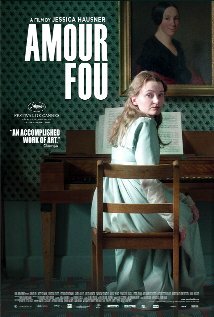 Now she spawns elegance with the classy period drama “Amour Fou”, set in Berlin, 1811, where a depressed romantic poet persuades an unhappy high-society lady to die with him. The story is based on the life of German poet, dramatist, and writer, Heinrich Von Kleist, whose melancholy is compellingly conveyed by the preeminent performance of Christian Friedel. Heinrich utterly suffers in this world, and love seems to be what feeds and inspires him, even if we think that he’s inclined to transform it into a tragedy. At first his choice was the well-positioned Marie, who doesn’t give him the importance he thinks he deserves, refusing to die with him, and announcing she’s about to get married. Then his eyes turn into Henriette Vogel (Birte Schnoeink), a melancholic married woman who convinces herself she’s gravely ill and nobody cares about her. Her husband loves her very much but often acts coldly while her own mother acts indifferently to her complaints; only her daughter Paulete is undoubtedly special. Filled with philosophical discussions and refined lyrical music, “Amour Fou”, which literally means ‘crazy love’, was given the appropriate title. Henriette, whose way of thinking was considered narrow-minded by her devoted-to-freedom poet friend, becomes under the spell of death, driven by the impetuous desire of leaving this world with someone who loves her rather than dying alone in a bed. Martin Gschlacht’s cinematography reminds us a perfectly illuminated canvas, often adorned with the stylish presence of a tall feminine servant, dressed in red and exhibiting gorgeous hats.